Created on Tuesday, September 23, 2014. 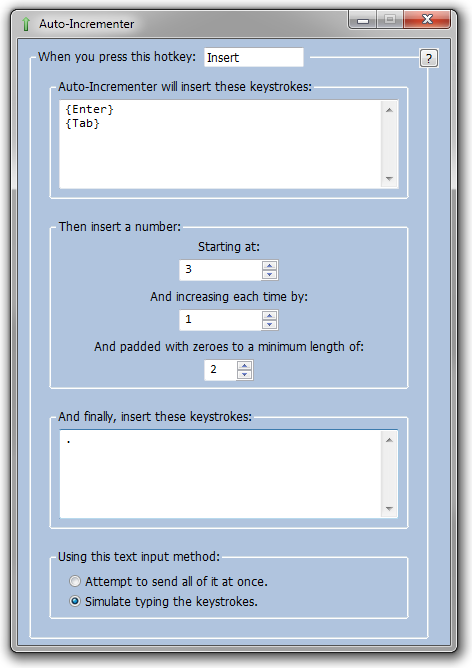 Auto-Incrementer is a tool that helps you number things quickly and easily with a single keypress. Auto-Incrementer is a tool that helps you number things quickly and easily with a single keypress. Numbering the files in a directory, prefixing or suffixing spreadsheet cells with numbers, all crazy kinds of stuff, man. As a simple example, the screenshot above shows Auto-Incrementer being used to make a Markdown-formatted numbered list. Download Auto-Incrementer (Windows, with source code). Either run the desired .exe, or download Autohotkey and run the included source .ahk. Do you need the same number to repeat multiple times? Just open a few instances of Auto-Incrementer and set each instance to a different key. Auto-Incrementer can now pad your number with zeroes to reach a minimum length. For example, specifying a minimum length of 3 will output 001, 002… 010, 011… 100, 101. Input method now defaults to simulate typing for better compatibility, and so you can hold down the input button to increment as fast as your computer will allow. Made number boxes wider. The character limit of 5 is unchanged.